Santa Monica, Why Hate on Exercise? Cranky residents, police crack down on fitness-crazed early birds. 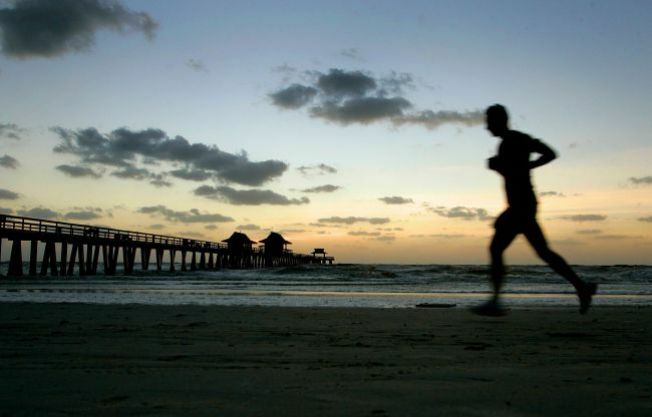 Ah, running at dawn by the ocean. How peaceful. Not so much for Santa Monica residents who aren't quite as chipper in the wee hours. Now the whole city's huffing and puffing. Sunny, beachy Santa Monica is known for its fitness obsession. What would it be without all the runners, roller rollerbladers, fit mommies jogging with strollers, and ubiquitous yogis walking to class with mats tucked under their sinewy arms? It wouldn't be Santa Monica, that's for sure. But all those fit-freaks may have to hoof it to another town. The New York Times reports that our fair city has started enforcing a fusty old ordinance that bans gathering on traffic medians -- where most folks gather for group exercise. What is this, middle school? Better break up that crowd of calf-stretchers before somebody gets killed. Or worse -- toned. Seriously, city residents do have a legit beef. Beach-side boot camps are all the rage, leading to bigger, louder, rowdier crowds getting pumped in the dewy early morning with drill-sergeant trainers. Some folks just aren't quite ready to rise and shine to 'Hoo-ah' shouts outside their bedroom windows at 6AM. Who knew? The Fourth Street median is the biggest offender as general meeting place for the famed beach-step workout. Breaking a sweat at this sweet spot could land you a $150 fine. A city meeting is planned for January 8 to work out a compromise. Meanwhile, officers are standing by to stop you in your downward-dog tracks.